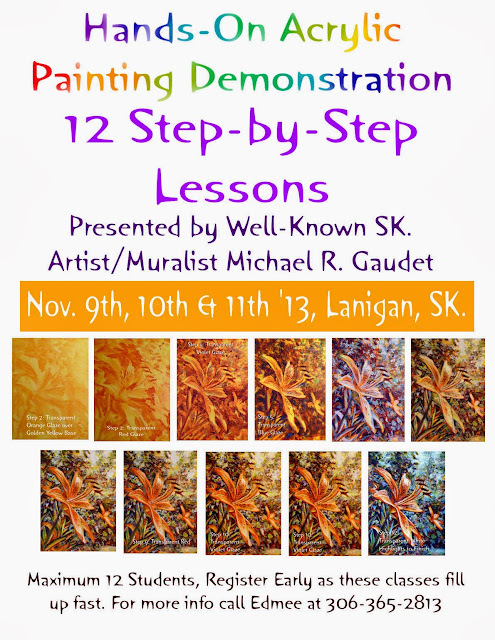 The Art of Michael R. Gaudet: 13 -Step Acrylic Glazing Class a Hit! 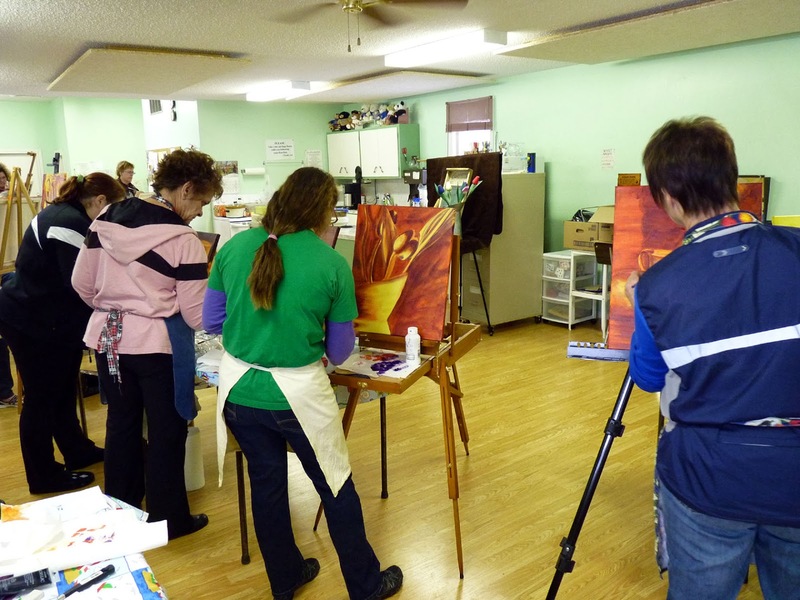 13 -Step Acrylic Glazing Class a Hit! Last weekend I was invited to facilitate an Art Class in Lanigan, SK., just a forty-minute drive from my home at the Resort Village of Manitou Beach. I felt very well prepared, as I now have a secret weapon in my teaching arsenal. Last year I created an online course that readers of this blog will be familiar with. The course is organized in 13 bite-sized pieces that very effectively de-mystifies the classical 'glazing technique' where multiple transparent layers are applied judiciously to arrive at a rich, life-like finish that appears to 'glow from within' when executed properly. Over the years you may have attended 'art classes' where the general gist was 'do your own thing'...'be creative'...'have fun'...AKA FLOUNDER and STRUGGLE without a whole lot of actual hand's-on technical guidance from the instructor. My approach is the exact opposite, as I lay out a specific technical strategy that when followed EMPOWERS and PROPELS you to a whole new level of satisfaction with your technical approach. Having set this straight, you will find that the actual image becomes clarified and dynamic. My approach of transparent glazing is eminently 'teachable' to anyone with basic drawing skills. The nine participants at the Lanigan Workshop succeeded in creating beautiful, lustrous still-life studies based on the 13-step method. My wife Sharon suggested beforehand that I play the '48-Second Painting' video -that covers the 13 steps- prior to the instruction and it turns out that this was a great idea! After the nine gals saw all of the steps covered in the video, they could more easily visualize and appreciate the process. This video is serving now as a powerful teaching tool to introduce the scope of the technique, like a map through the territory of glazing to a finished painting in 13 steps. After we viewed the '48-Second Painting' video, we set up a sprawling still-life on a table-top and had everyone form a semi-circle around for a good sight-line. We all used a small paper 'view-finder' ( a 5" x 7" piece of paper with a postage-stamp sized hole cut out of the center) to 'zoom in' on a particular detail of the collection of objects on the table. We set up a sprawling still-life on a table-top with a dark drapery behind it. 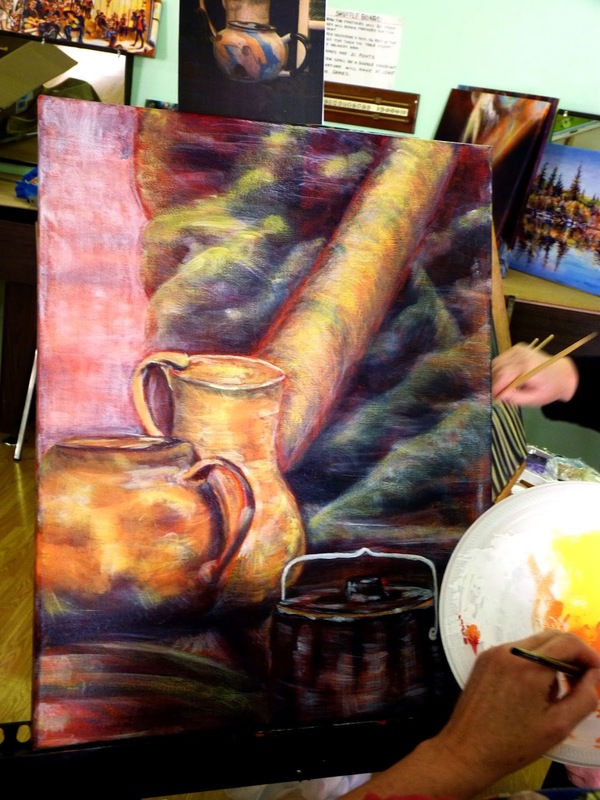 All of the participants selected a 'detail' of the still-life to focus on for their study. I asked everyone to focus in on a 'pleasing composition' of just two or three main shapes for this exercise. This is important, as it takes a lot of concentration to execute the 13 steps so for the most effective outcome, it is best to use the KISS principle. Too many objects in the still life pretty much defeats the purpose of learning the glazing technique. The still-life per se is only there to act as a catalyst in order to execute the 13 steps; a conceptual anchor. 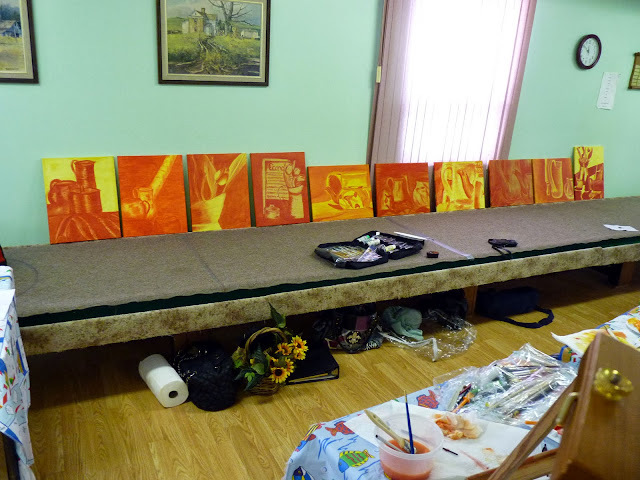 All nine paintings lined up for comparison and analysis after three steps. After the first three steps we lined up the paintings top check our progress. We had by now tinted the entire canvas a a golden yellow, then started to separate the dark from the light with successive transparent layers of orange and red. Carefully applying the second glaze of transparent red. Progressing into the transparent violet glaze, continuing to 'separate the light from the dark'. Space does not allow me to go into great detail with all 13 steps here, suffice to say all nine participants succeeded in finishing the exercise to arrive at very lovely, glowing paintings. I have it from them that is was very enjoyable and worthwhile. An excellent example of the rich, deep hues possible to achieve using the 13-Step Technique. Claire's painting, seen almost finished above, is an excellent example of how rich and lustrously you can lay on transparent glazes to achieve a beautiful 'back-lit' effect. The 'objects that Claire paints appear to be in glowing space and also suffused with light from within. Note the characteristic 'surface continuity' of the piece, how no one shape or area appears to be in isolation or 'stitched in' with the composition. Rather, there is a 'unified field' that binds the whole in successively more persuasive detail and resolution with each transparent (or translucent) glaze. All of the objects co-mingle comfortably with their shared atmosphere, charged with a glowing pallette of transparent colors. Shauna Johnson was the first to officially 'sign off' on her painting. Note the lustrous glow and the 'back-lit' effect in her painting. Well done if I may say so myself! Shauna Johnson excelled in her rendition of the rare old teapot that was the sentimental favorite of several of the artists.Turns out that the unusually colored teapot is a family heirloom which a member brought along as a contribution to the community still-life. It is so interesting and precious how a humble object such as this takes on epic proportions when it becomes the subject of a careful still-life painting, with all its intense visual and painterly analysis. Add a daub of sentimental value to the mix along with desire and enthusiasm and you arrive at a result as stunning as this! If the happy smiling faces are any indication, I would say that this introductory session was a big success! Left to Right: Julie, Claire, Rosalie, Brenda, Shauna, Edmee, Michael, Dianne, Melanie and Lorna. The careful and observant reader may have noticed a discrepancy between the title of this post ( 13 -Step Acrylic Glazing Class a Hit! ) 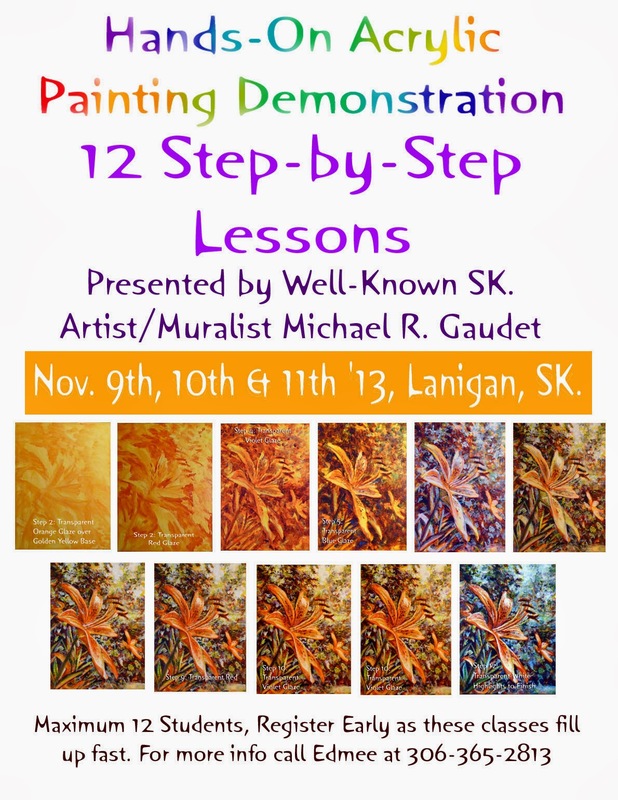 and the caption on the poster above ( ...12 Step-by-Step Lessons) . The reason for this is that the technical part is actually 12 steps...the 13th step is your own creativity! At this moment we are planning a follow-up session at Lanigan so what does that tell you? The chemistry was great, the reception was warm and friendly and the appetite to learn more about this exciting technique has been whetted! 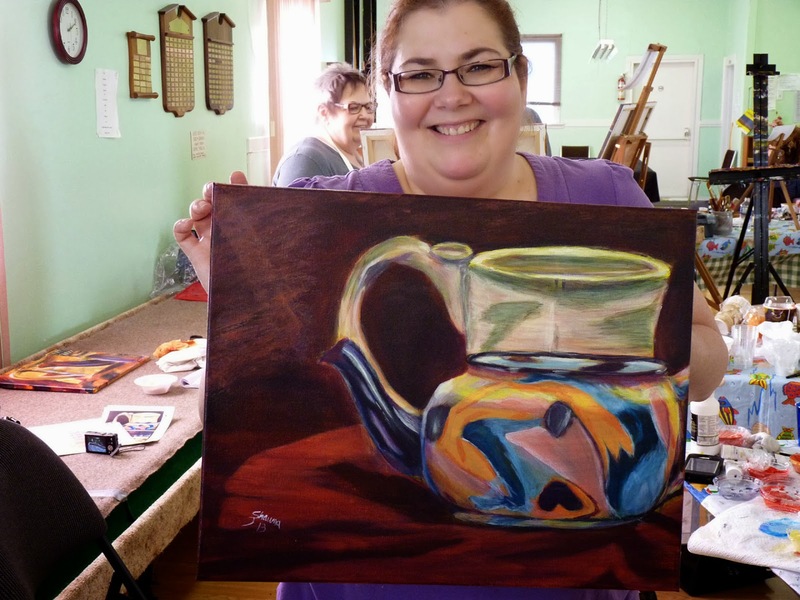 If YOU would like to organize a hand's-on painting workshop in your community, please contact me at mrgaudet@gmail.com to discuss the details.